For the first time, researchers have peered inside the brain to study the realtime effect of the psychedelic drug LSD (lysergic acid diethylamide). Yes, neuroscientists scanned the brains of subjects who volunteered to take a trip inside an MRI scanner, all in the name of science. While the researchers did not seem to document the detailed subjective experiences of their volunteers, the findings suggest that they were experiencing intense dreamlike visions, effectively “seeing with their eyes shut”. Under the influence of LSD many areas of the brain that are usually compartmentalized showed far greater interconnection and intense activity. LSD was first synthesized in 1938. Its profound psychological properties were studied from the mid-1940s to the early sixties. The substance was later banned — worldwide — after its adoption as a recreational drug. This new study was conducted by researchers from Imperial College London and The Beckley Foundation, which researches psychoactive substances. The profound impact of LSD on the brain has been laid bare by the first modern scans of people high on the drug. The images, taken from volunteers who agreed to take a trip in the name of science, have given researchers an unprecedented insight into the neural basis for effects produced by one of the most powerful drugs ever created. A dose of the psychedelic substance – injected rather than dropped – unleashed a wave of changes that altered activity and connectivity across the brain. This has led scientists to new theories of visual hallucinations and the sense of oneness with the universe some users report. 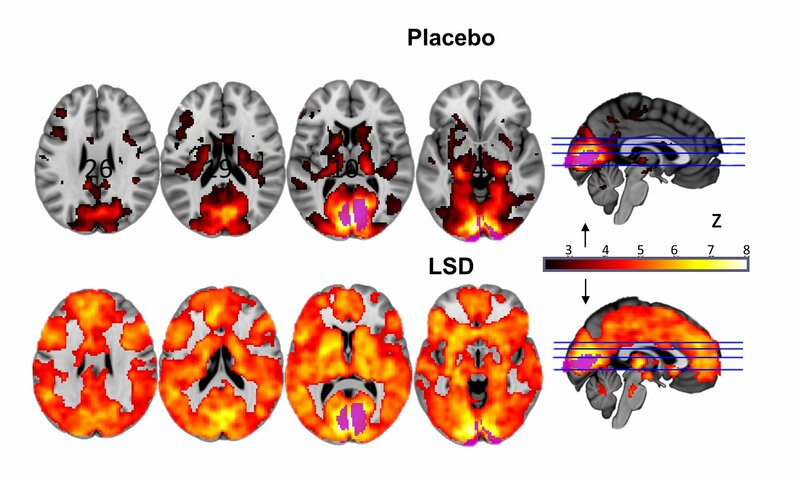 Image: Different sections of the brain, either on placebo, or under the influence of LSD (lots of orange). Courtesy: Imperial College/Beckley Foundation.